Knot Just Pizza FREE Open Cruise Night For May! You are again invited for more fun as we hit the road for West Palm Beach, and enjoy MORE GREAT wood fire pizza and Italian specialties at Knot Just Pizza! The FREE cruise in is open to all classic, custom, or cool. 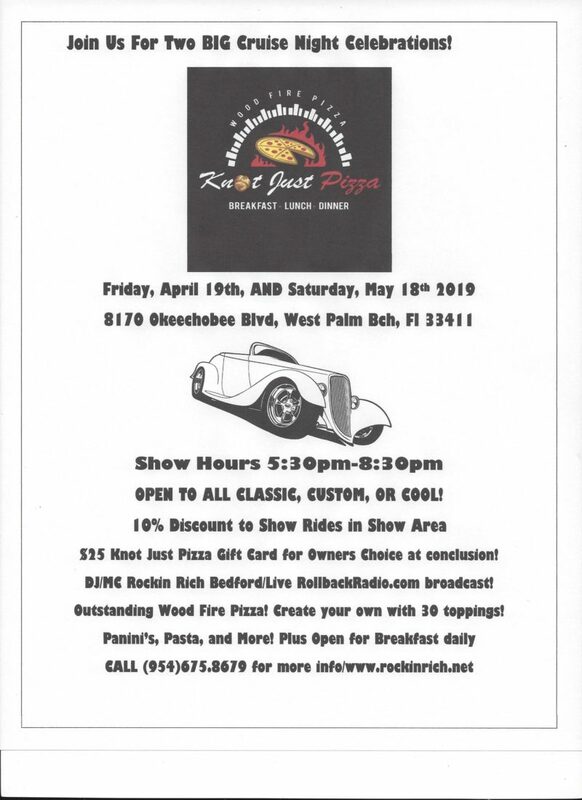 There is a 10% discount to show rides in the show field, plus a $25.00 gift card for “owners choice”. Great parking facility, DJ/MC Rockin Rich Bedford, LIVE radio broadcast on www.rollbackradio.com. Don’t miss out on all the fun, pannini’s, pizza, sandwiches, pasta, and desserts. Show hours are 5:30pm till 8:30pm. Call 954.675.8679.